Calling antimatter 'regular particles going back in time' is cute but only really helpful if you've got a Feynman diagram and you want to spin it around to face a different direction. It doesn't change the arrow of time problem. It is merely the absence of an arrow of time at the individual-interaction level, just like we had in Newtonian mechanics. Calling antimatter 'regular particles going back in time' is cute but only really helpful if you've got a Feynman diagram and you want to spin it around to face a different direction. As far as I understand it, Feynman's path integral formulation is the best description we have of reality. As far as I understand it, earlier interpretations of quantum mechanics weren't compatible with special relativity. Also, to get Feynman's path integral, you need to take into account virtual electrons going into the future and virtual positrons going into the past. And this is the most accurate description we have of reality. Without taking into account virtual positrons going into the past you get a much less accurate prediction. In fact, a many orders of magnitude less accurate prediction. > Also, to get Feynman's path integral, you need to take into account virtual electrons going into the future and virtual positrons going into the past. if it's in one configuration it's called an electron and it goes forward in time and it looks like what we think of as an electron, or it can be in another configuration, and it looks like what we think of as a positron, because this other configuration is different like that and this is going into the future like everything else including the flow of information. There is a vey strong symmetry which at the interaction level is vitally important. Focusing overly-closely on this level when trying to find the arrow of time will trip you up, because at that level there isn't one. Configurations don't travel through time. They are different at each time. If you only took into account all possible interactions going into the future, I guess you would be able to explain half of the noise. Wouldn't that be many orders of magnitude less accurate? Zanthius, which of us has actually taken a graduate school class in quantum field theory? You keep pulling out pop-sci explanation videos. I've derived the time-propagator and proven causality for quantum fields. This seems like an argument from authority: https://en.wikipedia.org/wiki/Argument_from_authority. If you have developed such a proof, why don't you post it here instead of making an appeal to authority? I also doubt that you are more educated in quantum field theory than the guy speaking in the PBS spacetime videos. Matt O'Dowd is an Australian-born astrophysicist. 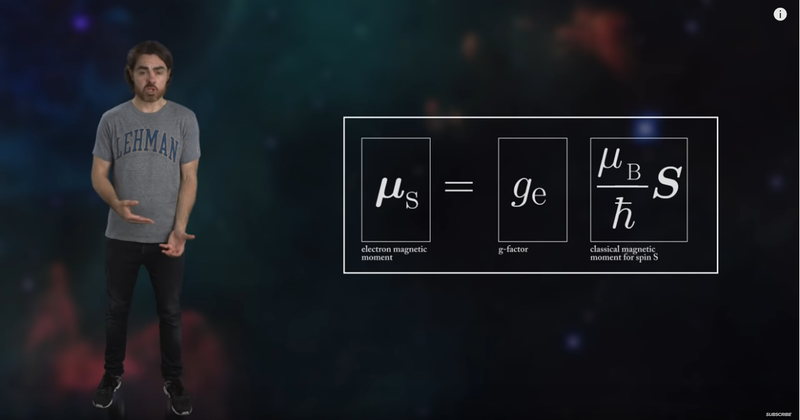 He is an assistant professor at the Physics and Astronomy Department at the Lehman College of the City University of New York and writer and host of PBS Space Time on YouTube. He is a frequent guest on Science Goes to the Movies on CUNY TV, and StarTalk radio with Neil deGrasse Tyson. Are you a professor in astrophysics? Anyhow, if you proved time propagation in quantum fields, I guess you must have used a Hamiltonian formulation, which as far as I understand it is a more limited form of the Lagrangian formulation. The Hamiltonian in classical mechanics is derived from a Lagrangian, which is a more fundamental quantity relative to special relativity. The Hamiltonian indicates how to march forward in time, but the time is different in different reference frames. The Lagrangian is a Lorentz scalar, while the Hamiltonian is the time component of a four-vector. So the Hamiltonian is different in different frames, and this type of symmetry is not apparent in the original formulation of quantum mechanics. I also doubt that your "proof" of time propagation is compatible with special relativity. If the Lagrangian is invariant under a symmetry, then the resulting equations of motion are also invariant under that symmetry. This characteristic is very helpful in showing that theories are consistent with either special relativity or general relativity. Antimatter is in every precise meaningful sense matter moving backward in time. The notion of "moving backward in time" is nonsensical in a Hamiltonian formulation, because the whole description can only go forward in time. That's the definition of what the Hamiltonian does--- it takes you forward in time a little bit. So if you formulate quantum mechanics the Hamiltonian way, this idea is difficult to understand (still it can be done--- Stueckelberg discovered this connection before the path integral, when field Hamiltonians were the only tool). I am saying that you are having interpretation problems because someone has dumbed it down to the point that you can do it without doing math you cannot reasonably be expected to do. And that math says that the two pictures, one with actual backwards time travel and one without, are equivalent. You can describe it that way for discussions of individual interactions because it's convenient - I'm not saying those people are wrong - , but when you get to discussions of macro-scale phenomena like thermodynamics, talking of actual propagation backwards in time is a mistake. Note, at 7:25 in that video, he said 'one way to think about…' this. It's a view that has certain benefits for certain purposes. When you try to apply this view to other purposes without his saying it's a good idea, you lose all of the protection his authority grants. You can describe it that way for discussions of individual interactions because it's convenient - I'm not saying those people are wrong - , but when you get to discussions of macro-scale phenomena like thermodynamics, talking of actual propagation backwards in time is a mistake. Of course. I am talking about virtual interactions. I don't think there are lots of non-virtual positrons here on Earth, and I guess that in order for something to go back in time at a macro-scale it might need to be built from large amounts of non-virtual antimatter which we don't necessarily have access to here on Earth. However, if there are VIRTUAL positrons going back in time, it might prove that particles CAN go back in time, and certain aliens might have access to much more antimatter than us. Maybe we also could use some weakly interacting antimatter to send a message back in time. Or if we built a magnetic field in a vacuum, maybe we could keep charged antimatter particles there, which could be used to send messages back in time within the magnetic field. The messages could be encoded as perturbations in the magnetic field generated by the antimatter ions. Virtual-ness isn't a property of a particle. It's a property of a diagram you make about particles. If you have an electron undergo one interaction in one set of diagrams and then have it undergo another interaction in another set of diagrams, it's 'real' between them. But you are free to re-draw that as one big set of diagrams… and then suddenly the electron is 'virtual' all that time. And diagrams are not fundamental. They are how you organize your knowledge about what the propagation operator is doing. The propagation operator itself points straight back to time being pointed away from simple boundary conditions. The propagation operator itself points straight back to time being pointed away from simple boundary conditions. If you made a magnetic field in a vacuum, couldn't that function as a boundary condition? And if you keep antimatter inside the magnetic field, maybe ions inside the magnetic field will propagate in the opposite time-direction? Also, isn't it possible that dark matter is made of weakly interacting antimatter? Physicists in the US and Canada have proposed a new particle that could solve two important mysteries of modern physics: what is dark matter and why is there much more matter than antimatter in the universe? The yet-to-be-discovered “X” particle is expected to decay mostly to normal matter, whereas its antiparticle is expected decay mostly to “hidden” antimatter. The team claims that its existence in the early universe could explain why there is more matter than antimatter in the universe – and that dark matter is in fact hidden antimatter. And that math says that the two pictures, one with actual backwards time travel and one without, are equivalent. Sure. I am not arguing that they aren't equivalent. But don't you get twice as many possibilities if you include both the forward possibilities and the backward possibilities? 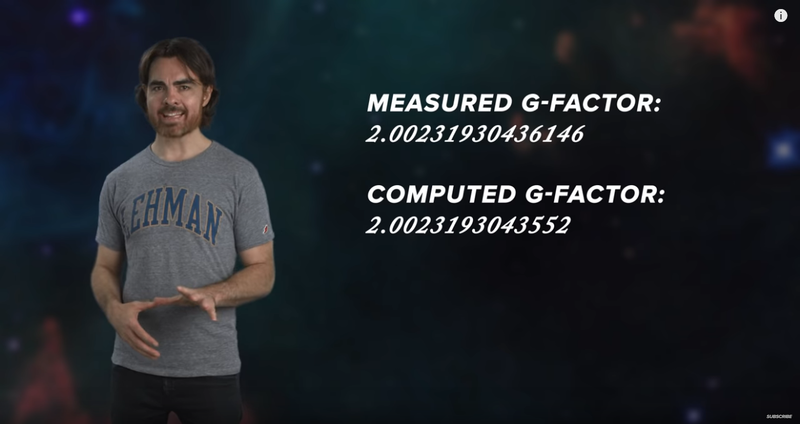 Why do you think the g-factor is around 2 and not around 1? And diagrams are not fundamental. They are how you organize your knowledge about what the propagation operator is doing. Well, well... the path integral formulation is based on mathematics, not a diagram. But diagrams and mathematical formulations can be equivalent. For example, you can use regression or a machine learning algorithm to find a formula that fits a graph or geometrical shape. You can use the Schrödinger equation to visualize atomic orbitals, but you could probably also use a machine learning algorithm to find the Schrödinger equation from the shapes of the atomic orbitals. You might think that graphs and geometrical shapes are "dumbed down" mathematics, but it is actually better to say that humans are much better at dealing with geometrical shapes than with mathematical formulas, since humans have a much larger part of the brain devoted to visual processing. A different species might be horrible at dealing with geometrical shapes, but much better than humans at processing mathematical formulas. A member of such a species, might think that mathematical formulas are "dumbed down" geometrical shapes. Since humans haven't evolved to see 4 (or more) dimensional shapes, it is probably easier for humans to deal with the mathematics of 4 (or more) dimensional shapes, than to visualize them. So maybe we should consider the mathematics of a 4 (or more) dimensional shape to be a dumbed down geometrical shape? You need to include those in one way or another; taking the time-travel interpretation of the mathematics is not necessary. They don't need to be, but look at it this way - each diagram corresponds to an integral. Do you know what that integral is? In this sense, it is dumbed down. Important parts were left out. And when you look at those important parts, you find that there is no need to, and indeed, it hurts to, consider the action of antimatter to be traveling backwards in time. Feynman diagrams/integrals are used to predict the anomalous magnetic dipole moment. 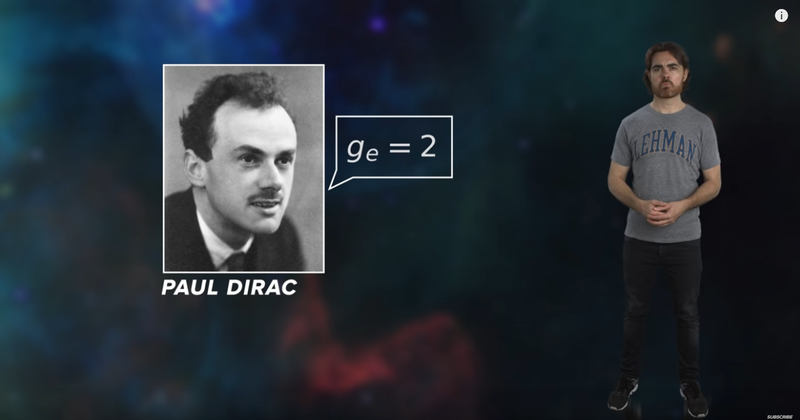 In quantum electrodynamics, the anomalous magnetic moment of a particle is a contribution of effects of quantum mechanics, expressed by Feynman diagrams with loops, to the magnetic moment of that particle. As I have said earlier, this gives us one of the most accurate descriptions of reality we have today. The QED prediction agrees with the experimentally measured value to more than 10 significant figures, making the magnetic moment of the electron the most accurately verified prediction in the history of physics. I don't quite understand how you can claim that one of the most accurate descriptions we have of reality today is leaving important things out. Do you have a better way to predict the anomalous magnetic dipole moment, which doesn't use Feynman diagrams/integrals? Without Feynman diagrams/integrals, it seems like you would be 10 decimal places farther away from predicting the g-factor. This is getting incredibly frustrating. FEYNMAN DIAGRAMS HAVE MORE THAN ONE INTERPRETATION. You can see them as including backwards-time-traveling things, or you can NOT see them as including backwards-time-traveling things. The math and the consequences work out the same either way. As I've said what feels like six times. No reason to be frustrated. We are just trying to figure out how reality works. I just wonder why you would expect a g-factor of 2.00231930436146 from the math with only forward time interactions, and not a g-factor of 1.00115965218.